Day 4 of Project Valentine, and I'm a little discouraged. I really tried to pick four classic romances for the first four movies, but it's not working out entirely how I'd hoped. I've seen four good movies, movies with interesting stories and scenes that contained love interests, but I don't think that any one of them could be strictly termed a romance film. 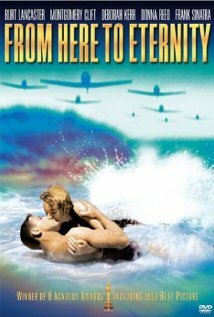 I thought for sure that From Here to Eternity would be the movie to crank up the romance. I mean, it's #20 on AFI's 100 Years, 100 Passions list! Its most famous scene (the one that everybody on earth has seen, even if they haven't seen the rest of the movie) is of Burt Lancaster and Deborah Kerr tumbling in the surf together. It's right there on the box cover of the movie! Really, though, the movie is more of a melodrama, set against a background of army life. There happen to be two love stories involved in the plot, but they never really succeeded in making me feel like they were the central plot. And I don't want to spoil that beach scene for you if you haven't seen it, but they only kiss for like 5 seconds and then fight for like 5 minutes. Still, I do recommend this movie for several reasons. First, for its place in film history - FHTE took home some serious hardware at the Oscars. Second, for its place in film metahistory - remember the part of The Godfather where Don Corleone gets the plum movie role for washed-up singer Johnny Fontaine, who then goes on to win the Oscar? Rumors have it that Mario Puzo took more than a little inspiration for that character from Frank Sinatra, who at the time he was cast in this part was a little washed-up in his own career, and who went on to win the Oscar. And speaking of Sinatra, this was the first movie I've ever seen of his. It's interesting to see "The Chairman of the Board," a man whose persona was largely made up of the power that he wielded over everything around him, step into the role of Maggio, a pipsqueak peon. He even gets to sing for a quick second or two! As far as the romantic aspect of the movie goes, maybe it worked better for audiences of a different era. Kerr and Lancaster's relationship, although passionate, is adulterous and clearly doomed from the outset. The other relationship, between Montgomery Clift and Donna Reed's characters, begins in jealousy and never really shows us a clear reason why it advances past that to the point where they trust and need each other. Like I said, though, the romances really take backseat to the drama of the story of barracks life that makes up most of the rest of the movie, and that's a pretty solid story. RATING - Definitely worth seeing. I give this one four bugle mouthpieces out of five. LESSON - This part is proving more difficult than I had thought! I'm going to say that the lesson from this one is twofold. First, don't let passion blind you to differences which either need to be worked out or acknowledged. Second, treasure time together, because you never know when it may end. And let's not forget Ernest "Fatso" Borgnine, winner of this year's SAG Life Achievement Award. Went over to IMDB and watched the "trailer." Funny to see how marketing has changed. It consists of text cards playing with the words in the title, the credits "Montgomery Clift as...," a quick clip of the surf smooch and done. Hey Danny, I highly recommend The Manchurian Candidate. Sinatra is awesome and the whole movie is really great. Angela Lansbury is totally amazing especially if you (like me) associate primarily with Murder She Wrote. Love that movie. I heard somewhere that Angela Lansbury was only three years older than the actor who played her son, which makes me think that she was pretty much born looking like a grandma.